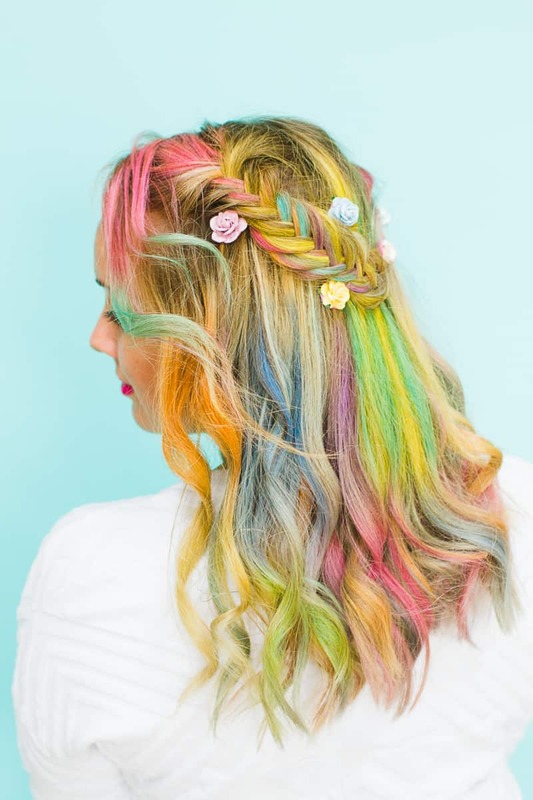 CREATE THIS COOL FESTIVAL STYLE RAINBOW BRAID! Eeeeeek I am about to make your Sunday all types of fun! I was so excited to get to work with ghd on this colourful hair tutorial today! My go to hairstyles are always usually a combination of braids and waves, I love how diverse they can be, adding a touch of glam to a casual outfit or an effortless style to wear to the beach and the best news is they are so easy to recreate at home. As it is festival month here on the blog, I thought this style would look so cool with colombré hair. I absolutely adore how the colours weave through all the different layers and the pretty bobby pins add an extra touch of boho – perfect for festival brides. If you are new to colombré, where have you been? Rainbow hair is trending so hard right now and I love it! I actually discovered it last summer and created a hair chalking tutorial which you can see here. If like me you are not completely sold on the idea of dyeing your hair permanently, hair chalk is the perfect temporary solution. The colour possibilities are endless! You can watch the tutorial on how to create this fishtail braid and boho waves below or by going to our YouTube Channel here! P.S. You can get the Rachel Bobby pin set from Crown & Glory here! !